Software Support driver supports IVI Scope, IVI Digitizer and IVI FGen class with IVI- C and IVI-COM interfaces. Windows Support The digitizerNETBOX/generatorNETBOX can be accessed from Third-party Software Products Windows 7, Windows 8,Windows 10 (each 32 bit and 64 bit). Most popular third-party software products, such as LabVIEW, Programming examples for Visual C++, C++ Builder, LabWin- MATLAB or LabWindows/CVI are supported. All drivers come dows/CVI, Delphi, Visual Basic, VB.NET, C#, J#, Python, Java and with examples and detailed documentation. IVI are included. Embedded Webserver Linux Support The integrated webserver The digitizerNETBOX/generatorNETBOX can be access- follows the LXI standard ed from any Linux system. The Linux support includes SMP and gathers information systems, 32 bit and 64 bit systems, versatile program- on the product, set up of ming examples for Gnu C++, Python as well as drivers for the Ethernet configuration MATLAB for Linux. SBench 6, the powerful data acquisi- and current status. It also tion and analysis software from Spectrum is also included as a Linux allows the setting of a con- version. figuration password, ac- cess to documentation Discovery Protocol and updating of the com- plete instrument firmware, The Discovery function including the embedded helps you to find and remote server and the identify any Spectrum LXI webserver. instruments, like the digitizerNETBOX and generatorNETBOX, avail- Hardware features and options able to your computer on the network. The Discovery function will also locate any Spectrum card products that are managed by an LXI Instrument installed Spectrum Remote Server somewhere on the network. The digitizerNETBOX and generatorNETBOX are fully After running the discovery function the card information is cached LXI instrument compatible and can be directly accessed by SBench 6. Furthermore the quali- to LXI Core 2011 following fied VISA address is returned and can be used by any software to the LXI Device Specification access the remote instrument. 2011 rev. 1.4. The digitizerNETBOX/generatorNETBOX has been tested and approved by the LXI Consortium. SBench 6 Professional The digitizerNETBOX and Located on the front panel is the main on/off switch, LEDs showing generatorNETBOX can be used the LXI and Acquisition status and the LAN reset switch. with Spectrum’s powerful software SBench 6 – a Professional license digitizerNETBOX/generatorNETBOX chassis version V2 for the software is already in- The chassis version V2 got stalled in the box. SBench 6 sup- a complete re-design to al- ports all of the standard features of low some new features the instrument. It has a variety of that improve the handling display windows as well as analy- especially for mobile and sis, export and documentation shared usage: functions. • 8 bumper edges protect the chassis, the desk and other compo- • Available for Windows XP, Vista, Windows 7, Windows 8, nents on it. The bumper edges allow to store the chassis either Windows 10 and Linux vertically or horizontally and the lock-in structure allows to stack • Easy to use interface with drag and drop, docking windows and multiple chassis with a secure fit onto each other. For 19“ rack context menus mount montage the bumpers can be unmounted and replaced • Display of analog and digital data, X-Y display, frequency by the 19“ rack mount option domain and spread signals • The handle allows to easily carry the chassis around in juts one • Designed to handle several GBytes of data hand. • Fast data preview functions • A standard GND screw on the back of the chassis allows to con- nect the metal chassis to measurement ground to reduce noise IVI Driver based on ground loops and ground level differences. The IVI standards define an open driver architecture, a set of instru- ment classes, and shared software components. Together these pro- Front Panel vide critical elements needed for instrument interchangeability. IVI's Standard SMA connectors are used for defined Application Programming Interfaces (APIs) standardize all analog input signals and all trigger common measurement functions reducing the time needed to learn and clock signals. No special adapter a new IVI instrument. cables are needed and the connection is secure even when used in a moving envi- The Spectrum products to be accessed with the IVI driver can be lo- ronment. cally installed data acquisition cards, remotely installed data acqui- sition cards or remote LXI instruments like Custom front panels are available on re- digitizerNETBOX/generatorNETBOX. 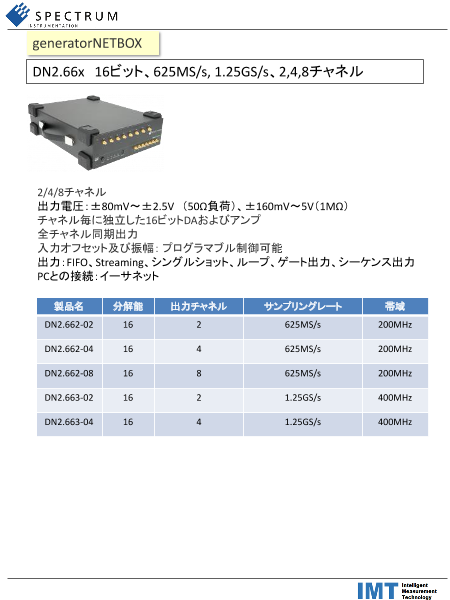 To maximize the compatibil- quest even for small series, be it BNC, LEMO connectors or custom ity with existing IVI based software installations, the Spectrum IVI specific connectors. Three additional XIO lines Repeated output The generatorNETBOX that When the repeated output mode is used the data of the on-board contain two AWG generator memory is played continuously for a programmed number of times cards can optionally extend- or until a stop command is executed. The trigger source can be ei- ed, such that the three addi- ther one of the external trigger inputs or the software trigger. After tional XIO lines (marker the first trigger additional trigger events will be ignored. output) of second internal AWG are also routed to the to front-plate. This option is only avail- Single Restart replay able for the DN2.662-08 and DN2.663-04 models. When this mode is activated the data of the on-board memory will be replayed once after each trigger event. The trigger source can Ethernet Connectivity be either the external TTL trigger or software trigger. The GBit Ethernet connection can be used with standard COTS Ethernet FIFO mode cabling. The integration into a stan- The FIFO mode is designed for continuous data transfer between dard LAN allows to connect the PC memory or hard disk and the generation board. The control of digitizerNETBOX/generatorNET- the data stream is done automatically by the driver on an interrupt BOX either directly to a desktop PC request basis. The complete installed on-board memory is used for or Laptop or it is possible to place buffering data, making the continuous streaming extremely reliable. the instrument somewhere in the company LAN and access it from any desktop over the LAN. Multiple Replay DC Power Supply Option The Multiple Replay mode al- lows the fast output genera- The digitizerNETBOX/generatorNET- tion on several trigger events BOX can be equipped with an internal without restarting the hard- DC power supply which replaces the ware. With this option very standard AC power supply. Two dif- fast repetition rates can be ferent power supply options are avail- achieved. The on-board memory is divided into several segments of able that range from 9V to 36V. the same size. Each segment can contain different data which will Contact the sales team if other DC lev- then be played with the occurrence of each trigger event. els are required. Using the DC power supply the digitiz- Gated Replay erNETBOX/generatorNETBOX can be used for mobile applications The Gated Sampling mode al- together with a Laptop in automotive or airborne applications. lows data replay controlled by an external gate signal. Option Embedded Server Data is only replayed if the gate signal has attained a The option turns the digitizer- programmed level. NETBOX/generatorNETBOX in a powerful PC that allows to run own programs on a small Sequence Mode and remote data acquisition The sequence system. The digitizerNET- mode allows to BOX/generatorNETBOX is en- split the card hanced by more memory, a powerful CPU, a freely accessable memory into sev- internal SSD and a remote software development access method. eral data segments of different length. These data segments are chained up in a user chosen order using an additional sequence The digitizerNETBOX/generatorNETBOX can either run connected memory. In this sequence memory the number of loops for each seg- to LAN or it can run totally independent, storing data to the internal ment can be programmed and trigger conditions can be defined to SSD. The original digitizerNETBOX/generatorNETBOX remote in- proceed from segment to segment. Using the sequence mode it is strument functionality is still 100% available. Running the embed- also possible to switch between replay waveforms by a simple soft- ded server option it is possible to pre-calculate results based on the ware command or to redefine waveform data for segments simulta- acquired data, store acquisitions locally and to transfer just the re- neously while other segments are being replayed. All trigger- quired data or results parts in a client-server based software struc- related and software-command-related functions are only working ture. A different example for the on single cards, not on star-hub-synchrnonized cards. digitizerNETBOX/generatorNETBOX embedded server is surveil- lance/logger application which can run totally independent for External trigger input days and send notification emails only over LAN or offloads stored All boards can be triggered using up to two external analog or dig- data as soon as it’s connected again. ital signals. One external trigger input has two analog comparators that can define an edge or window trigger, a hysteresis trigger or Access to the embedded server is done through a standard text a rearm trigger. The other input has one comparator that can be based Linux shell based on the ssh secure shell. used for standard edge and level triggers. Singleshot output External clock input and output When singleshot output is activated the data of the on-board mem- Using a dedicated connector a sampling clock can be fed in from ory is played exactly one time. The trigger source can be either one an external system. Additionally it’s also possible to output the in- of the external trigger inputs or the software trigger. After the first ternally used sampling clock on a separate connector to synchro- trigger additional trigger events will be ignored. nize external equipment to this clock. Reference clock The option to use a precise external reference clock (normally 10 MHz) is nec- essary to synchronize the instrument for high-quality measurements with external equipment (like a signal source). It’s also possible to enhance the quality of the sampling clock in this way. The driver automatically generates the requested sampling clock from the fed in reference clock. External clock input and output Using a dedicated connector a sampling clock can be fed in from an external system. Additionally it’s also possible to output the in- ternally used sampling clock on a separate connector to synchro- nize external equipment to this clock. Reference clock The option to use a precise external reference clock (typically 10 MHz) is nec- essary to synchronize the instrument for high-quality measurements with external equipment (like a signal source). It’s also possible to enhance the stability of the sampling clock in this way. The driver automatically generates the requested sampling clock from the fed in reference clock.